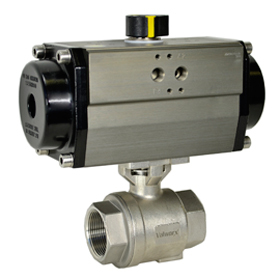 Valworx 523616A air actuated spring return stainless steel ball valves are typically used for on-off control of air, water, oil, and other media compatible with the materials of construction. 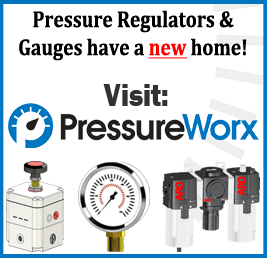 Spring return actuators use an air pressure signal (80-120 PSI) to open and springs to close the valve. The valve will fail closed upon loss of air signal. Maximum working temperature of assembly is 180 °F. Order optional valve mounting kit to extend media working temperature to 300 °F (suitable for steam up to 50 PSI max. with kit). Advantages of air actuated ball valves over other type valves may include: higher flow rates, higher pressures, higher temperatures, wider media compatibility, straight through flow path, reduced water hammer, and use in hazardous environments. Ball valve can be mounted in any orientation.